After our cooking class with Reyna Mendoza Ruiz, Robin Greene, MFA, led us in a writing about food discussion. She referred us to Poet Laureate Mark Strand’s poem, “Pot Roast.” He uses words masterfully: gaze, sit, spoon, “I bend, I raise my fork in praise.” We come to a place where we are ‘eating poetry.’ To understand the interrelationship between food and poetry, we must write it out, memorize it, hear the sound repetitions, embed it in our bodies. This is the way to eat poetry. So I go back to the image of Reyna bending over the metate, grinding the roasted peppers into the paste that will become the base for the mole roja. I take notes and write. 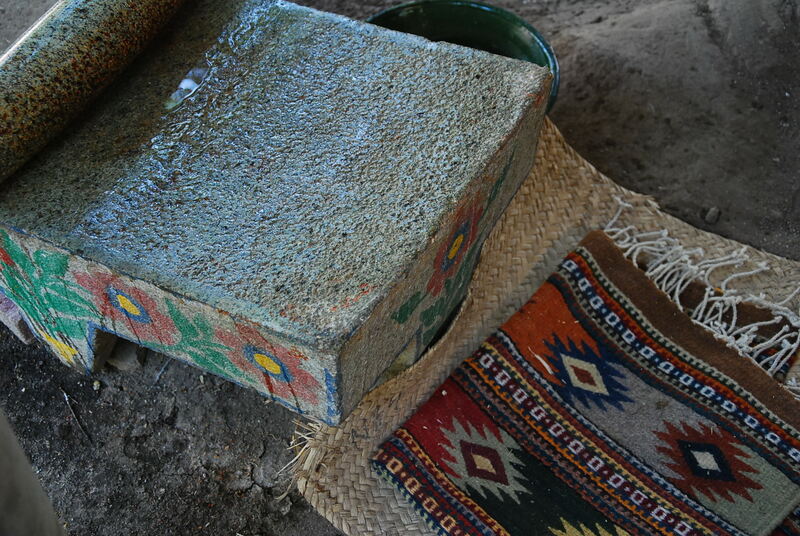 Then, I try my hand at the metate and write some more. “My fingers are stained red from the grinding of the peppers on the metate, ancient instrument of women’s work. The peppers become paste. My wrists turn “la mano de metate” — the hand of the metate. The stone in my hand grinds against the stone platform that sits on the ground. My back bends, I wipe brow sweat with the edge of my apron. I have hardly just begun. An electric machine would be easier I whisper under my breath. Kneel, Reyna says. We offer an optional cooking class with Reyna for those who wish during the women’s creative writing and yoga retreat. It is a great way to stretch your creative cooking and writing skills. This entry was posted in Cultural Commentary, Food & Recipes, Teotitlan del Valle, Travel & Tourism, Workshops and Retreats and tagged art, class, cooking, culture, food, Mexico, Oaxaca, poetry, retreat, traditions, workshop, Writing, yoga. Bookmark the permalink.